1. Click Browse from the main menu and select Projects to view available projects requiring skills that match yours. Filter options are available on the results page. You can filter projects by Type (fixed-price or hourly), Skills, Listing Types (upgrades), Budget, Location, and Languages. 2. To view more details about the projects that you are interested in, simply click on them from the project list. 3. Read the project description thoroughly. Here are five things to check before bidding. When you are certain that you can do the work and that the project is right for you, click Bid on This Project. 4. 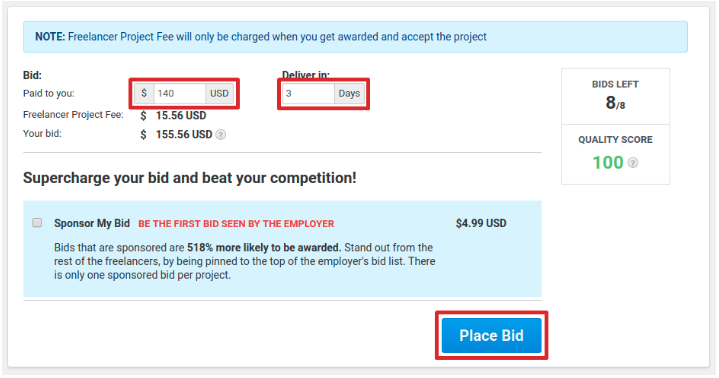 Enter your bid amount and delivery time. You can also sponsor your bid (optional). Click Place Bid. 5. Compose a detailed proposal. Include your experience, credentials, portfolio. etc. On the Proposed Milestones section, you can propose a breakdown of the tasks needed to complete the project and indicate their corresponding Milestone Payments. To see the projects you placed bids on that are still open, go to My Projects, and select Active Bids. If you are unable to place bids on projects, check this article to find out the possible reasons why.